Nann at With Strings Attached likened my Big Reorganization Project (BRP) to an archeological dig. I think that's a very apt description. I've come across things accumulated in days long past and things I have no recollection of ever purchasing, receiving as a gift, or using in a project. Yet, there they sit among the detritus of my quilting life! The BRP continued today with refolding, sorting, and storing fat quarters in ArtBin Super Satchels. You may remember that in June 2014 I got some cabinets at Habitat Re-Store that included a tall segmented unit which I planned to use for fat quarter storage. Well, it turned out the cubbies, with painted black interior, were deep and things just got lost in the darkness. That case has been relegated to the garage. Over the course of 15+ years I have used various methods of folding and storing FQs, none of which has been entirely satisfactory. My intention today was to standardize to a size that would fit in the subdivisions of the satchels. As I opened, smoothed, and refolded each piece, I was sensitive to the variety of textures -- some smooth as silk, some coarse and common -- and to the changing color palette over the years. 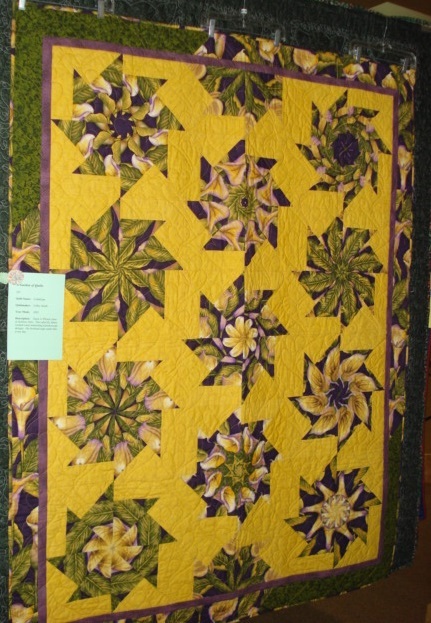 I was also surprised that my eye frequently chose "modern" motifs, long before I knew what modern quilting was. I filled three and a half satchels and added them to the short shelf just to the right of my cutting table. My thought -- and please don't laugh -- is that if the strips and fat quarters are close at hand and visible, I will be more inclined to use them. AND, more importantly, I should be more inclined to put them away! My One Monthly Goal (OMG) for April has been to clean up the quilting mess that has taken over the house. It had gotten so bad that I was embarrassed to post a "before" photo. This is the view I get today as I enter my "studio" in the basement. Still looks pretty bad until you step further into the room. I have wrangled 100+ gallons of scraps into squares, triangles, and strips -- 1-1/2", 2', and 2-1/2" -- that are separated into bins. The stash fabric has all been folded and sorted into color groups. These pictures were taken a few days earlier; I have filled the gaps since then. The work table has been cleared to the point that I can press larger pieces of fabric. The storage room contents have been condensed and reorganized. The large chunks (smaller than a FQ) of scrap fabrics have found a new home in bigger bins. And the fat quarters will find a new home in some Art Bin Super Satchels. Yet, another month passes with my OMG goal not quite met. Honestly, this was not the best month to pick this goal as I lost the better part of two weeks to travel and social obligations. I feel good about what I did accomplish and will continue the process until I can again work at my sewing table and can clear off the dining room table. There's a machine in there somewhere! Thanks to Heidi at Red Letter Quilts for hosting the One Monthly Goal (OMG). Participating has really helped me stay focused. I swore it wouldn't happen, that I wouldn't be tempted, that there is no fabric in the world precious enough for me to bring home from Paducah. BUT, at least I shopped with a purpose, limiting myself to Japanese/Taupe-like fabrics to complete my Geese on the Move (a/k/a Geese Migration designed by Cynthia Brunz). Though I'm not really counting this year, in the spirit of full disclosure I must admit I acquired about 25 yards of new fabric which includes almost 3 yards of a wide back for my gray/yellow Exploding Pineapple and 5 yards of gorgeous Sumi-e' by Frond Design Studios for a special new project (more on that later). I ordered a Featherweight insert for my Sew-Ezi table and came home with 5 spools of thread and the booklet, Quilter's Precut Companion by C&T Publishing with input from Jenny Doan/Missouri Star Company. This is a Must-Have in my book! While I missed connections with Kevin the Quilter and Charlene (Geema), I was able to meet Jan Ochterbeck, The Colorful Fabriholic. What a delight! AQS-Paducah is history. It's Sunday. Hop over to Patchwork Times to see how others are managing their stashes. Thanks, everyone, for your favorable comments on my first RSC16 orange exercise. Sad to say, you won't see more of that size because my orange scrap strips are all smaller sizes. However, I did find some spare time away from the BRP (Big Reorganization Project) early this week to make some 4" Buckeyes with my orange scraps. Several folks commented on the orange/green combo so I am making some green ones, too! If I'm lucky, Angela will pick lime green for May and I'll be ahead of the game. They are so easy to make with my already-cut strips that I think I will go back to the earlier RSC16 colors and make more. So I'm holding off on how I will set these until I have more ready to go. I'll link with Angela at sosrappy when she posts later today. I think I've gone to my last Paducah AQS Show. I won't say "never" because I said that the last two years and changed my mind at the last minute. It's gotten so big and crowded that I don't enjoy it anymore. I know there are ways to avoid the crowds and parking juggernaut; I'm just not inclined to try. Maybe the Fall show will be less crowded -- at least for a while. Yep, they're going to have a second show in September 2017, replacing the Chattanooga show. So if you're in the SE, this is the last year for Chattanooga. Such a shame because that venue is so nice. Frankly, I think there are too many big shows these days. I enjoy the smaller shows and like to go to new places so if you have any suggestions for quality shows, let me know. Have you ever done the Grand March? The couple in front of you has to step ahead so that you and your partner can take their place. One couple turns to the right; the next turns to the left. That's how the BRP has gone the last two days. Move one thing so you can put another in its place. Having stepped away from the BRP last week to meet some deadlines and enjoy some social occasions -- including my 71st birthday -- I dove into the storage room reorganization Monday with gay abandon. By that, I mean I gaily abandoned a bin of dress fabric, piles of mouse-chewed batting, a stack of fleece cut into scarf widths, a few toys, and other miscellaneous items that were taking up space on the shelves on my side of the storage room. Goodwill, here I come! I realized that there was valuable real estate in that storage room where I could safely store bins of my least-used fabrics and projects, but I needed to clear some things out and compact what was left. I filled two bins with batiks to make room for my scrap strip baskets over the cutting table and added another shelf on that wall to keep the scrap baskets separated. I moved the batting remnants from that top shelf to the top shelf in the storage room. The batting has been replaced with stacks of reproduction fabrics. I'm not doing much with reproduction fabrics these days, but I wanted them to be visible in case I need the color for a particular project. How come he got more space? We have exposed water and sanitary piping in the ceiling so I have been careful to put MY things in plastic storage bins. Now do you understand why I've been sewing in the dining room? As I said, I'll be heading to Paducah after doing the grocery shopping in the morning. I'm looking forward to connecting with a few blogging friends while I'm there. I should have internet access and be able to post updates. If you are going to be there through Friday, send me an email with your phone so we can connect (hopefully). I blame it on Cynthia Brunz (Quilting is More Fun Than Housework). 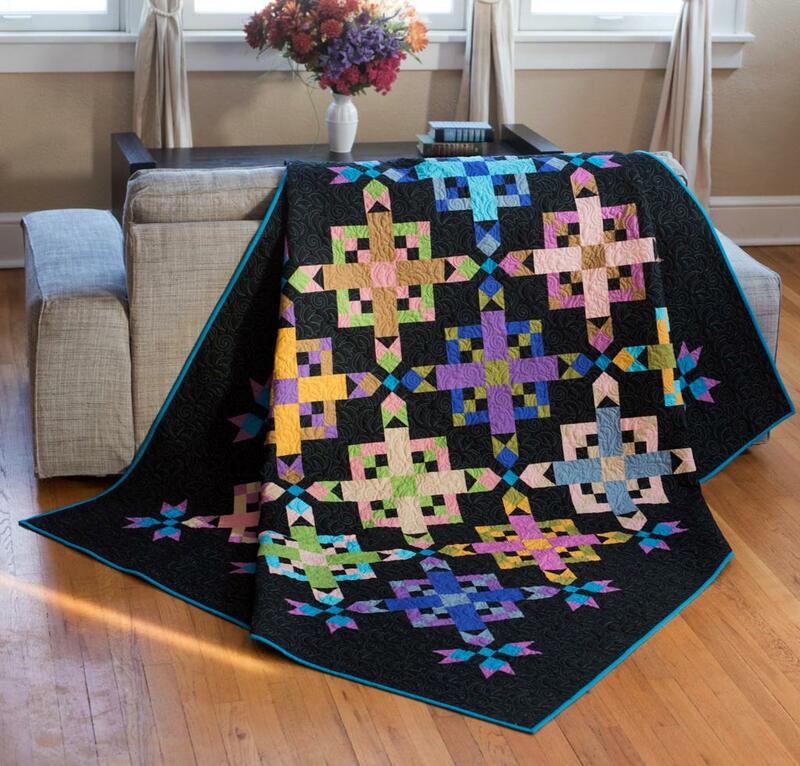 She blogged recently about a new product -- solids in luscious colors, available from Craftsy. She tried it, she liked it, I bought it. But it wasn't so much the fabric as the pattern by Debbie Caffrey that attracted me. I love quilts where the block looks different depending on the fabric placement. I don't usually purchase kits; I just couldn't resist this one. I will let you know what I think of the fabric when I use it. I'm not counting this year, but it helps to be upfront with myself (and you) to keep my stash reduction headed in the right direction. I'll be linking up with Judy at Patchwork Times. My one ode to orange so far this month. In the meantime, take a look at soscrappy for more beautiful orange. 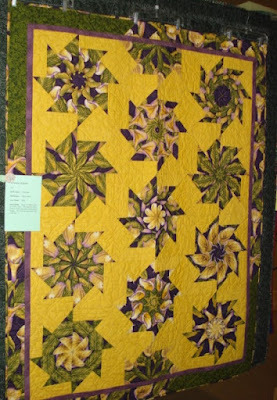 The modern quilt guilds in Tennessee have organized a "Thoroughly Modern Mini" quilt exchange amongst the four guilds. Tempest fugit, as they say, and the deadline was approaching. What to do -- what to do? The only clues I had were that my exchange partner likes jewel tones, especially eggplant, lime, orange, and aqua. This is what I settled on. I'm still not happy with the lack of contrast in the upper left corner. My first background was much lighter and looked wimpy. The only darker gray I could find not only did not contrast well with the dark eggplant, but was just dead when I tried it. So I went with what I had on hand. I'm hoping I can bring some emphasis to the lighter star with the quilting. At least I have the flimsy ready to show at the guild meeting tomorrow. The Big Scrap Reorganization project is wrapping up -- for now. All the strips have been pulled, pressed, trimmed, and sorted from two 70-gallon plastic totes. I will attack the larger pieces later. The dining room table is still a mess, though. I realized that I had a couple of deadlines that needed to be addressed this week. 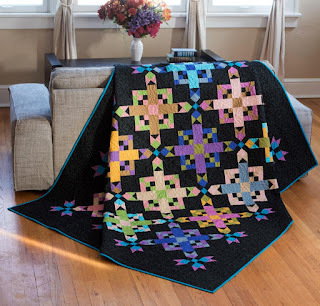 Make a block (or two) for a friend who is putting together a charity auction quilt. Prepare backs for a couple of quilts going to the longarm quilter Thursday. Start construction of a modern mini that is due the second half of May. 1. In November members of the Midwest Fabric Study Group each received a bundle of repro FQs with instructions to make at least one 12" block using one of the FQs supplemented by something from ones stash, due before April 19. Well, it slipped my mind until I started cleaning up and ran across the FQs. I used the Buckeye Beauty block. Four blocks together make a 12" block. And reversing color placement yields another. These two blocks went in the mail to Indiana this morning, along with a few extra 4-patches. One deadline down. 2. I need a back for the Classic 4-Patch. I am undecided which other top I will be taking but since my LAQ is about 30 miles away I usually try to take at least two tops to be quilted. 3. I made quite a bit of progress on the Modern Mini last night. I have been vacillating about a design since my exchange partner said she likes everything. She did say her favorite colors are eggplant, lime, aqua, and orange. Somewhere I got it in my head that she said she liked traditional with a modern twist -- oh, wait, that was me! Regardless, I settled on a traditional star with a second smaller star inside. I made this block several years ago -- 16 of them, to be exact -- for a block swap. This pattern for a 12" block was in Quilters Newsletter Magazine, July/Aug 2005. My mini can be no bigger than 24" square. Rather than put four blocks together, I decided to just enlarge the pattern to 18" and add a border of the same background fabric so it floats. Doing the math has been challenging -- thank goodness for Easy Angle and Companion Angle rulers! This is what I have accomplished so far. Lighting on the floor is not the greatest but even in person I'm not sure the smaller star stands out enough. I may use a brighter color or I may change the large star center to the darker eggplant fabric to provide more contrast. I want to at least have the flimsy done so I can show it at the Music City Modern Quilt Guild meeting on Saturday. The quilting will be my May OMG. I need to make a 12" block for a friend who is making a charity quilt with donated blocks. This is the pattern I chose to make -- simple and easy -- but somehow my confidence in what size pieces I need to cut was shakey so I decided to run up a sample with my orange scraps. I decided I wouldn't keep up with fabric in-and-outs this year. But I have made a conscious effort to not purchase anything -- until yesterday. If you've been following the Purple Project Saga, you know that I was looking for a butter yellow solid for the side setting triangles. I circled the county on Saturday, stopping first at my favorite LQS, The Quilting Squares in Franklin, TN. They don't have a LOT of fabric, but they do have a wonderful cross-section from modern to repros and their stock turns quickly. They also have a line of original patterns published as The Franklin Quilt Company (hope I got that right, going from memory) and some original tools like their binding ruler. Anyhoo, they didn't have the shade of yellow I was looking for so I bought a yellowish Grunge (second from top) as an acceptable backup piece. I can never have two much Grunge. I even bought a couple of yards of the white variety to replace some in a project that I had raided last year. I also needed a neutral background to go with an eggplant/lime/orange combo I'll be using in my mini exchange. I think the sweet gray crosshatch on top of the stack will serve me well. Then it was on to Hobby Lobby. Although their off-brand solids had the right color, I wasn't happy with the quality of the fabric so passed on that opportunity. Nothing in their Konas to meet my needs. On to Jo-Ann where I found something close to the Kona I was trying to match and the quality isn't half-bad (for a change). At $5/yd I figured I couldn't go wrong so came home with 1-1/2 yards. It feels good to have held off adding anything significant for this long. Of course, Paducah is coming up later this month! Speaking of Paducah, I will be there Thursday and most of Friday so if you are in the area, let me know and we can share some BSA strawberries or something stronger. You may be thinking, like some who have commented, that I need to take a break and do something "fun" for a change. Bear in mind that in the first four days I also did 6 (or was it 7?) loads of laundry, prepared 4 dinners, and did the weekly grocery shopping. So, doing something, ANYTHING, with fabric is fun by comparison! While it has been challenging going through the mound of scraps, pressing, trimming, and organizing them, I am SO looking forward to the end result that I am still enthusiastic about this project. Thursday morning I took a look at the "Parts Department." I analyzed what was already there -- a set of blocks, a collection of stripsets, a germ of an idea -- then made notes about what existed, what direction to take, and what might go with it. These are all bagged and stored in a shoe box waiting to be grabbed when I have a free moment or on the serendipitous occasion when something matches the Rainbow Scrap Challenge color of the month. Thursday afternoon I attacked the second 70-gallon tub of scraps. Hey, I told y'all this was getting out of hand, so chill, OK? Thankfully, this tub contains mostly strips and strings. Just a little press and put in piles of large, medium, small, and strings. But it quickly became obvious that the little bins I have been putting the strips in will not hold the volume I have generated. So Friday, after serving lunch to some of the homeless at Nashville's Room in the Inn, I made a trip to The Container Store. Oh, My! I can go crazy in that store! I was hoping that was where I had gotten the plastic bins I've been using because they are the perfect size to hold a WOF strip folded twice. They had everything else but. I was also looking for other organizing ideas and came home with a couple of these. I managed to spend a bit of time with my little pile of orange, hoping to pull together a few blocks for the Rainbow Scrap Challenge this month. Reporting in with Angela at soscrappy for Scraphappy Saturday. So on Sunday I set about the Spring Cleaning OMG project. Since there's no clear surface in the sewing room, I brought a 70-gallon Rubbermaid tote up to the dining room with a plan to sort through and organize the scraps it contained. At this point I'm thinking it will take about 2 days. I thought there'd be more!! ... which only added more volume to what had previously been compressed into an amorphic blob. After a whole day of pull-press-cut-pull-press-cut -- you get the idea -- where the ironing board was in the kitchen and the cutting mat in the dining room (FitBit almost exploded that day!) I revised my plan and methods. ... and large chunks (by color). I also moved the cutting mat to the kitchen where the counter height was more conducive to cutting. Two days into the process, I still had about 35 gallons of scraps! I needed to streamline things a little further. Not only did I move the ironing board right next to the cutting mat, I decided to press the remaining scraps all at once, then do the trimming and sorting with the bins right in front of me on the counter. That went much smoother, but after 4 days I am still left with a pile of pieces/parts, trying to decide if I can create a block or two out of the remnants from previous projects. All-in-all this has been a trip down memory lane. I came across a single scrap left from the first quilt I ever completed, a quilt for AA who was born in August 2001. And a large number of triangles cut from another early quilt, a Stack-'n'-Whack which my husband snoozes under daily. The color is a much richer gold than I captured in the photo -- kinda wild and crazy. Notice the line where I removed stitches along the top right edge? Well, I was a beginning quilter, trying to use up things I already had on hand, like thread. This thread was a deep purple, probably 100% polyester, on one of those large spools you could get at the checkout counter at Hancock Fabrics. I knew there was a problem when a purple line developed down the front of my machine where the thread rubbed. Oh, well, there's a lot of purple in that quilt and it doesn't show, thank goodness. A Tip for Tuesday - Pay Attention! !